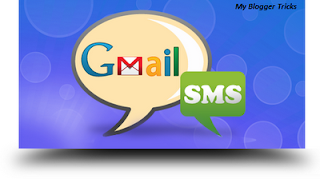 How To Send FREE SMS With Gmail To Any Mobile In Any Country? Short Messaging Service is great! It is fast, it is cheap, and it is convenient! Not to mention very popular especially among the youth. It lets you connect with your friends and family no matter where in the world you are. A few years ago, Google launched its SMS chat service via Gmail. But then it withdrew the service and took it back to its lab. This service was relaunched some time back, but was limited to very few countries, like U.S. etc. Well here's a good news! Google has, very recently, introduced updates to the service. Gmail SMS messaging is now available across a lot more countries, including Asian countries such as Pakistan, Afghanistan, India etc. You can now send texts to a lot of networks in many countries, absolutely free! 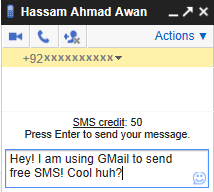 Send SMS text messages right from Gmail. You chat from your comfy computer and reach your friends on the go; they get your messages as texts and can peck out replies on their little keyboards. Sending SMS is simple. You of course need to have a Gmail account for sending SMS. Sign in to your Gmail account, and open up the Chat pop up menu from the bottom left if it already isn't there. Click on the little arrow, and Add a new contact. You will asked to enter an email to invite a contact. 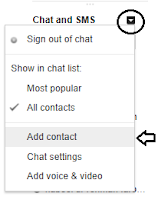 Note that if you want to chat a friend that is already your contact, then you can skip ahead to the next step. 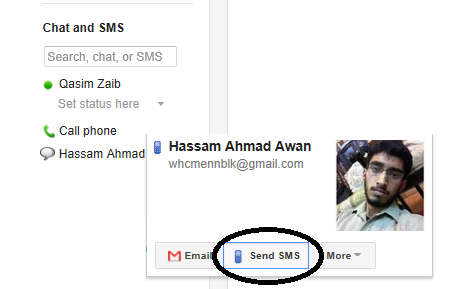 Now, hover on a contact of yours, and click on the Send SMS button as shown below. Note : If you haven't sent that contact an SMS before, of if you haven't added their number, then instead of the Send SMS button, there will be a Chat button at the exact same position. Click on this button and you will see a small pop-up at the bottom right of your screen, as shown below. Click on the Continue this chat over SMS button. This will only appear if you haven't added their number, or haven't sent them an SMS before. 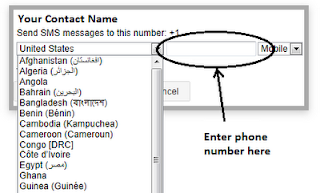 Otherwise, you will be able to enter your SMS in this pop up. Once you click the continue button, you will be prompted to choose a country and mobile. This is the contact's mobile number. Add a number and then save. Step 3 : Chat away! Once you have entered the mobile number, a pop-up will again appear at the bottom right exactly where the previous one did. This is your chat box. You are now ready to go! Type a message in the text field , hit Enter, and sit back and wait for your friend's reply! This is a smart way Google has found to encourage the use of this service. Initially, you are given fifty credits, which means you can send out 50 messages. For every one message sent, one credit is deducted. But for every message received, say when someone replies to your Gmail text, you get 5 credits. So tell your friends to stop being miserly, and start replying to texts :). You can not, however, exceed the 50 credit limit, no matter how many replies you get. What if you lose all the credits? Well, you will receive one credit after 24 hours. A smart way to increase your credits would be to send a text to your own mobile phone, and then replying to it any number of times to refill your credits! Google does not charge anything for this service. However, since this is a new service to most countries, some carriers might charge you for it. Usually, you won't be charged for sending SMS through Gmail. The receiver might be charged a small amount if he chooses to reply to that message. Otherwise, standard messaging rates apply. Read more about SMS Charges at the Google Chat Support page. The reason that this service is so exciting for us is that, it wasn't available for our country before. Not only for us, but for most of our readership as well, this is a big news. The inclusion of this region shows that Google is working to expand its services, which is a good thing. Previously, in the U.S, this service was limited to a few operators. Now, all U.S operators are supported. And the influence has expanded outside the U.S as well. Now, more than 50 countries are included, with hundreds of supported operators. And this influence is expanding fast! For Pakistan, Ufone and Mobilink, the major mobile operators in this area, are supported. In India, Reliance, MTS, Aircel, and other major networks are supported.